You need to be absolutely sure you can afford to raise a dog. Even if you’re adopting and not buying. There are other expenses, including vaccinations, annual checkups, regular visits to the veterinarian, regular grooming, equipment, toys & food. Also, emergency vet visits can be costly. Expenses may also vary with regards to the dog breed and its size. So, consider all that before bringing a puppy home. 2. Before you even bring your dog home, make sure you have all of the necessary supplies. This includes dog food, dog treats, bowls, (chewable) toys, dog wipes, dry dog shampoo, regular dog shampoo, dog toothpaste, canine toothbrush, canine hairbrush & a training crate. 3. Consult their vet regularly. If your puppy has not been vaccinated yet, you should take them to the vet after a week of having them at home. Ask your vet for advice about how their diet should be, how often they should visit, when you can give them their first shower, how to maintain their hygiene and most importantly, before making any changes to their schedule/diet. Also, contact their vet if you detect any signs of undesirable changes in your dog’s behavior and/or health. Typically, puppies should have three meals per day, while adult dogs require only two. The portions should depend on your dog’s size and appetite. Fixing their eating schedule will help avoid obesity and will allow you to predict when they would want to relieve themselves. Also, set their last meal to at least 6 hours before bed and remove their water bowl 4 hours before bed. 5. House-training a puppy takes a lot of time and patience. 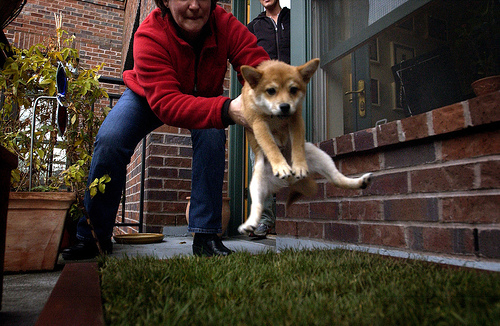 Sometimes, fully training a puppy may take up to months. However, you need to start it as soon as possible for optimal results. The key is consistency. For example, potty-training a new puppy typically requires you to take them outside/where they should do their business every hour, directly after they wake up from a nap, after playing and within 10 minutes after they’ve eaten and/or drunk. Older dogs require fewer breaks and it also depends on their breed and size. Crate-training is ideal in this case because it is an instinct of theirs to not relieve themselves where they sleep. Introduce them to the crate, get them to go inside on their own by placing a toy or a treat inside (do NOT force them inside). When they start showing signs of wanting to exit their crate, chances are, they want to go. If your lifestyle won’t allow it, you can consider adopting an older, house-trained dog through dog shelters or hire a personal trainer. Your puppy is like a human baby, you cannot leave them unsupervised for long periods of time, they might get in trouble or do their business where they shouldn’t, keep them in a dog-proof area or inside their crate if they’re going to be on their own for a while. Note: Do NOT end the training sessions too soon. 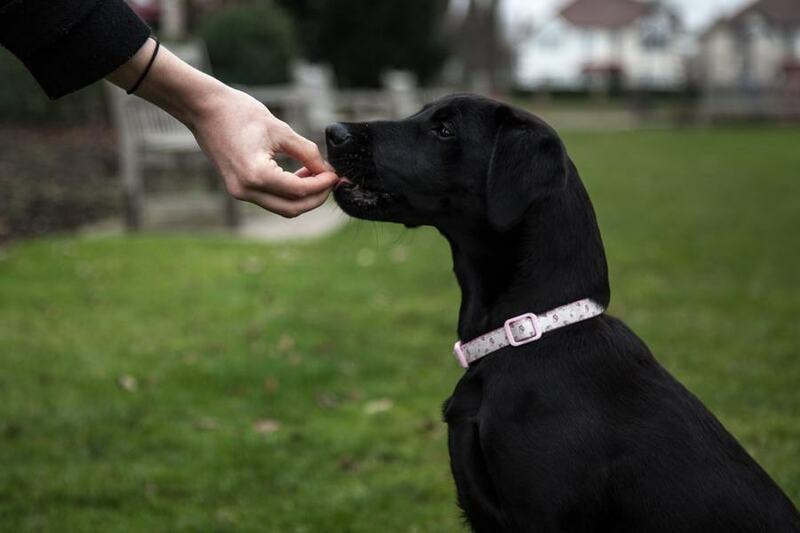 During the training periods, give your dog a treat and shower them with praise and love when they follow through. You can also treat them with a walk after they’ve done their business outside. Avoid doing that otherwise because you should teach them to associate treats/praise with good/acceptable behavior. The most important thing is to NOT punish your dog for having an accident. Dogs understand by making associations. So, if you catch them in the act, do not punish them because they’re more likely to associate the punishment with peeing/pooping in your presence and not with doing it where they’re not supposed to. If you do catch them in the act, take them immediately to where they should do it and clean up the mess with an enzyme-based urine removal products because dogs noses are more sensitive than you think and chances are they will go there again if they detect that smell. You can find these products at most pet shops around the city. Note: Typically when a dog starts sniffing that means they need to go. 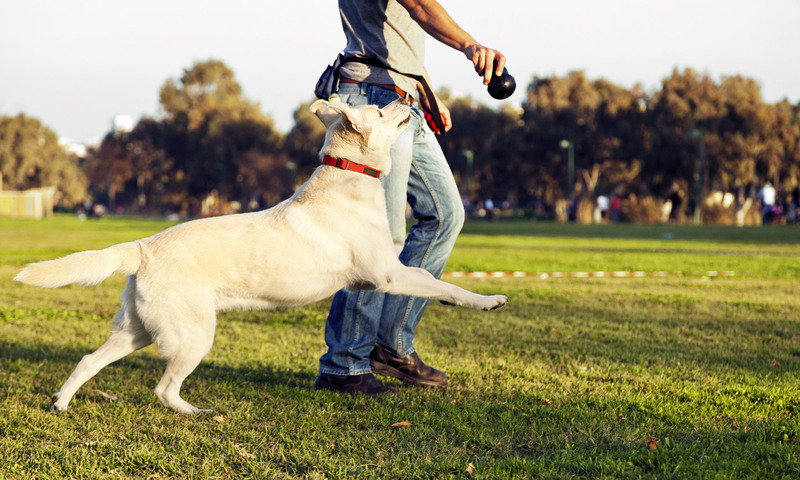 Make sure to factor time into your day for your dog to get enough exercise. Exercise needs vary from each individual dog, but it is recommended that “healthy adult dogs need at least 30 minutes of aerobic exercise twice a day.” It is also a good opportunity for you to communicate with your dog. Dogs, if left alone for long periods may develop anxiety and depression. Also, it is important to socialize your dog. Once they’re fully vaccinated and the vet confirms its safety, you can introduce your buddy to other dogs. Also, get them to meet other humans than yourself so they do not develop aggressive behaviors towards strangers. If your dog gets used to a certain behavior, they are likely to continue to behave like that for the rest of their life and the more they get used to it, the harder it becomes to reverse it. Make sure to change your tone when your dog misbehaves. Use phrases like “bad dog!” or “NO!” to indicate that they had done something wrong. Make sure to set up a daily reminder for their meals, training sessions, walks as well as, their vaccinations and vet visits. Next article5 Types of Assholes You Meet Every Now And Then. I write about things and stuff.